I returned the look. Can a woman ever have too many shoes? I paused for emphasis. I wanted what I said next to sink in. He studied me as if actually digesting what I’d just said. I knew better. But no matter. Since I picked the profession that I did and hit hospital floors running many moons ago, I have been after comfortable shoes. Walking, running, 12 to 14 hours straight on those hard, unforgiving floors was not exactly a recipe for foot pampering. Now adding, ahem, a certain amount of years, plus RA/RD, comfortable, supportive shoes have moved from a want to a definite must have. On this particular day, I’d been to see the optometrist. I’d decided my eyes needed some TLC after the bad news I’d received at the ophthalmologist. I ended up spending the equivalent of a month’s grocery money on two pairs of glasses, reading and distance. I didn’t want to deal with the whole learning curve thing required with bifocals, and why put that up-and-down-bobbing strain on my neck? But the main criteria the shoes had to meet was that they be out-of-the-box comfortable. When I found the cushiony softness I sought, I was not surprised to find that they were Clarks®. I was, after all, wearing buttery-soft (or as they call it: “marshmallow-soft”) leather sandals of the same brand. I kept them on, placed my sandals in the box and went to give the man some money. This “coincidence” prompted me to investigate my shoe collection when I got home. I was curious as to what was left in the closet after I’d given away several pairs of shoes that were still fairly new. And the reason they were only slightly worn is because they’d failed to provide the comfort level I craved and needed. 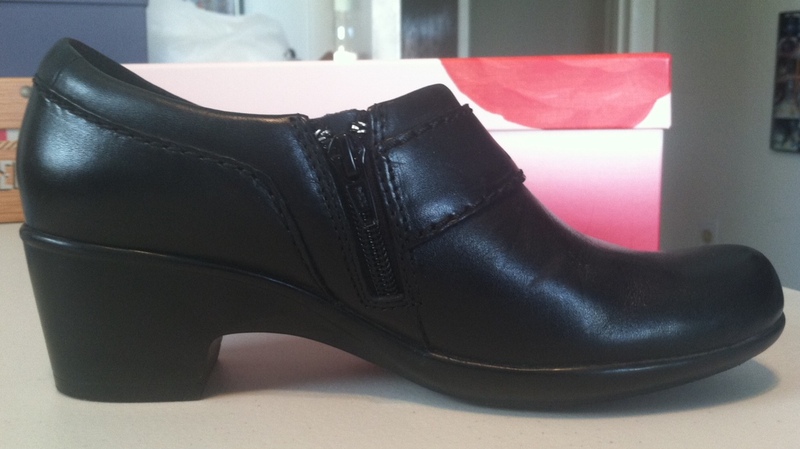 Halfway through my nursing career I’d given up the white shoes and wore black. And even though those were more stylish, they were still work shoes. My feet have taken a beating over the years and today, when comfort is even more of a priority, I don’t want to have to resort to wearing “work” shoes again. I want/demand style. Style reminiscent of my twenties when I sailed through life in clogs and jeans. That reminds me, I need more jeans. For the trips, you know. This entry was posted in Uncategorized and tagged Comfort, Shoes, Style on January 23, 2015 by Irma. Clarks are definitely my favorite brand. I love them. I also recently turned Mr. Phat50chick onto their loafers and he loved them so much he ordered another pair in a different color. He’s far more stylish than I am so I was happy. Comfort is far more important when you have RA and I’m only happy that athletic style shoes are more mainstreamed. I’m a sales professional and this is what I wear every day. I didn’t want to sound like a sales ad, but it’s true I came to owning these shoes by virtue of the comfort they provide. I was shocked to see that almost all my shoes say: Clarks. Shocked and pleasantly surprised. Glad you like them too! Try the Bendables, Wren. So soft and cushiony. And stylish as well. Why should we give that up? No reason! Happy hunting! Aren’t Clarks just the best? I kind of went through what you did, discovered my “go to” shoes were the same brand. I actually looked at those same pair, so I agree they are just darling. You deserve a nice (comfortable) treat! I wrote a post about my exercise shoes a while back. They were Clarks, of course. I’d worn out my nursing SAS shoes working out and these were even more comfortable. I hate having to take my shoes off at the airport and I refuse to deal with tying shoelaces on top of that. These well get me there just fine. I love boots, but in South Florida there’s not much opportunity to wear them. And I like heels, but only if I’m going to be sitting around most of the time. 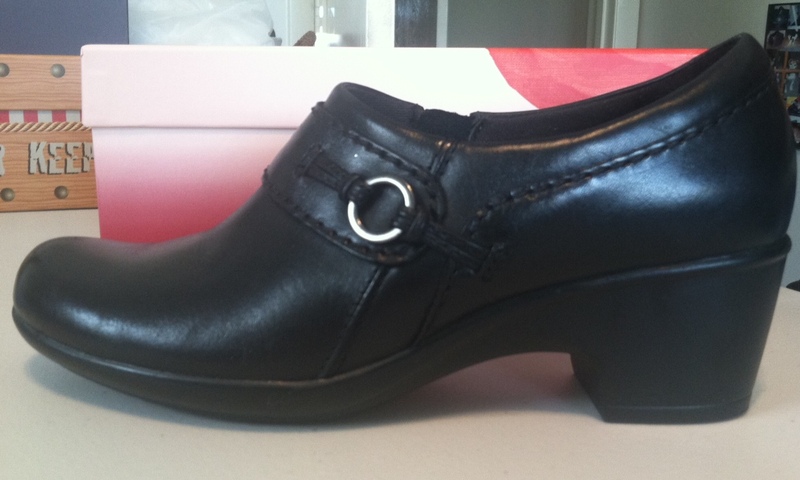 That’s why I prefer a clog, it can be dressy but without the hassle. But yes, comfort first, always.